Elsa Björkman-Goldschmidt was born in Linköping in 1888. She was the daughter of an officer and grew up in Linköping and Stockholm. Her mother is listed in the parish register as a “follower of Moses” (Jew). Elsa Björkman-Goldschmidt was a child and teenage friend of Elsa Brändström, Honorine Hermelin and Harriet Löwenhjelm. Elsa Björkman-Goldschmidt’s attendance at Anna Sandström’s advanced teacher training programme in Stockholm in many ways became decisive for her personal development and independence. She shared a flat with Honorine Hermelin for a few years, during which time she became socially and politically aware. Elsa Björkman-Goldschmidt also dreamt of becoming an artist, although this went against her family’s wishes. Whilst working as a substitute teacher she also took lessons at Axel Tallberg’s etching school and at the Konstakademi (Academy of Art) in Stockholm. In the early 1910s she undertook further studies abroad including in Bruges, Italy, and Germany. She largely worked with graphic arts (etching, woodcuts and lithography) and exhibited her works in Sweden, Oslo, Leipzig, Vienna, Paris, Rome and San Francisco. Today her work can be seen in the collections of several Swedish and foreign art museums such as the National and Modern art museums in Stockholm, Gothenburg art museum, Malmö art museum, Dresden museum, and the Albertina in Vienna. During the inter-war years Elsa Björkman-Goldschmidt gave up her artwork in order to concentrate on international aid work, popular education, journalism and writing instead. Elsa Björkman-Goldschmidt’s friendship with Elsa Brändström – later known as “the angel of Siberia” – in many ways led to her humanitarian and philanthropic activism. 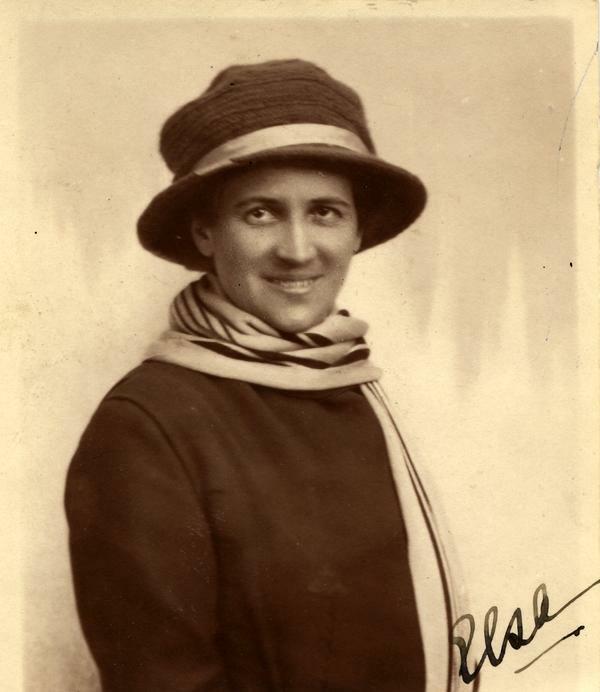 In 1916 Elsa Björkman-Goldschmidt travelled to Russia with Elsa Brändström in order to work as an untrained Red Cross nurse in the Siberian prisoner of war camps. Her encounter with the realities of war served as a brutal awakening, which she often returned to in her books. The Swedes struggled with typhus, cholera, scurvy, tuberculosis, malnourishment, frostbite, lethargy, and contrary Russian authorities. Elsa Björkman-Goldschmidt returned to Russia several times during the ensuing years serving as the Swedish delegate for the Red Cross. She experienced the Russian Revolution first hand. She met Waldemar Goldschmidt, the man who became her husband, in a hospital in Moscow. He was an Austrian-Jewish surgeon and a prisoner of war. The couple reunited after the end of the First World War and they married in Vienna in 1921. They lived in Vienna from 1919-1938 where they were members of various cultural circles. Elsa Björkman-Goldschmidt’s main employment at this time was as a journalist. She wrote causerie-style columns for Dagens Nyheter under the pseudonym Mélange. Once Nazi-Germany annexed Austria in 1938 the couple was forced to abandon everything and flee for their lives to Stockholm. Elsa Björkman-Goldschmidt was an activist who wanted to have a cause, to change the world, and to work on behalf of others. Upon her earlier return to what was then a politically lukewarm Sweden in 1918 she had stated that she felt like her “wings had been clipped” as she was no longer in the midst of developments and could not make a difference. Following her move to Vienna she continued her non-profit activism for victims of the war, but at that point it was mainly the starving and sick children of Austria who claimed her time and interest. She quickly and wholeheartedly threw herself into the recently re-vitalised Swedish Rädda Barnen (Save the Children). Known as “the Colonel on Gonzagagasse” she was in charge of the organisation’s activities in Vienna in very limiting and often chaotic conditions. Her remit included food, clothing, and medical deliveries, running a day-care centre, summer camps, and hospices for children, the transport of so-called war children to Sweden, and setting up sewing huts for widows of war. Elin Wägner, who was also active in Rädda Barnen, referred to Elsa Björkman-Goldschmidt in her work notebook as “the small touching Miss Björkman who sacrifices her livelihood” and drew a less than complimentary portrait of her as some kind of privileged slum nun in her 1920 novel Den förödda vingården. However, various contemporary sources testify to Elsa Björkman-Goldschmidt’s extensive activism, drive, and her importance to the children in Vienna at this time. In both contemporary reports and in later commemorative accounts and memoirs she also reflects a lot on the power struggles within all types of humanitarian aid and support work. When the Second World War broke out Elsa Björkman-Goldschmidt re-initiated her activism on behalf of children, now for the organisation Finlandshjälpen and as an employee of Rädda Barnen. In 1940 she joined the anti-Nazi Tisdagsklubben (Tuesday club), which was run by Amelie Posse and which for instance provided aid to refugees. Once the war ended she continued her work with Swedish refugee reception. She also returned to the ruins of Vienna in order to take charge of Rädda Barnen’s international aid work there. She wrote the manuscript for, collaborated on, and co-directed a number of plays and documentary films from Vienna on behalf of Svenska Europahjälpen. Along with Alva Myrdal and Kerstin Hellner, amongst others, she was also active in Samarbetskommittén för demokratiskt uppbyggnadsarbete (collaborative committee for democratic reconstruction work) from 1944 to 1951, which aimed to build a democratic Germany by offering courses and support to returning political refugees. Elsa Björkman-Goldschmidt often emphasised the freedom of being legally independent and self-sufficient as a woman. Her politics were most closely aligned to the libertarian liberal left, which campaigned on behalf of women’s rights to education and equality and for children’s rights. Through Honorine Hermelin she became involved in Kvinnliga medborgarskolan (women’s civic school) at Fogelstad as a guest teacher, lecturer, and course participant. She frequently contributed as a writer to the Fogelstad group journal Tidevarvet in the 1923-1936 period. After the school was closed in 1953 she became the editor of the commemorative book entitled Fogelstad. Berättelsen om en skola, 1956, which is an important source of knowledge about women’s political activism and the early feminist movement in Sweden. After her return to Sweden in 1938 she also frequently worked as a public speaker on behalf of the Folkbildningsförbund (public education association). During a speaking tour in Västerbotten in the 1940s she introduced the artist Berta Hansson who was working as a schoolteacher in Fredrika. Elsa Björkman-Goldschmidt’s writing output increased markedly from the 1940s onwards. She frequently made use of imagery from Vienna, as in the partly autobiographical Det var i Wien, 1944, Donaurapsodi, 1945, Wien vaknar, 1949, and Följ med till Wien, 1959. She also wrote a couple of novels including Jag begär efterlysning, 1951, and Söder om solen, 1953. She became well known for her biographies, two of which were about her friend Elsa Brändström, namely Elsa Brändström, 1932, and Elsa Brändströms liv och gärning i sammandrag, 1945. She also wrote about Harriet Löwenhjelm in an eponymously titled book published in 1947. She further edited Löwenhjelm’s letters and poems in an illustrated volume from 1952. From 1950 to 1978 Elsa Björkman-Goldschmidt was also a member of the literary society called De Nio (The Nine), where she served as the society secretary for almost a decade. At the same time, from 1957 to 1960, she served as editor of the society journal, Svensk litteraturtidskrift. During the 1960s she began to write her own memoirs and these were published in four volumes in the 1962-1976 period: Jag minns det som igår, 1962, Vad sedan hände, 1964, Den värld jag mött, 1967, and Vägen till Villagatan, 1976. Elsa Björkman-Goldschmidt was a cosmopolitan woman who often felt that Sweden was too narrow-minded and unaware about global suffering. She worked hard to educate people, particularly for women’s education and for the security and rights of children and refugees. As a writer she is recognised for her nuanced portraits of people from war-torn Europe, both of well-known personalities of the 20th century such as Elsa Brändström and of long-forgotten anonymous prisoners of war who vanished in the white Siberian expanses, which ‘callously revealed an individual’s vanity’. Elsa Björkman-Goldschmidt died in Stockholm in April 1982. She is buried at the Norra cemetery in Solna. Elsa Andrea Elisabeth Björkman-Goldschmidt, www.skbl.se/sv/artikel/ElsaBjorkmanGoldschmidt, Svenskt kvinnobiografiskt lexikon (article by Lina Sturfelt), retrieved 2019-04-20.